Trade fairs are the most efficient and, despite appearances, the cheapest way to gain a Chinese customer. The success largely depends on good preparations. However, being “well-prepared” for the fair is a much wider concept than we think compared to the exhibitions in Poznań, Cologne or Paris. Currently, China is among the most attractive markets for European food manufacturers, despite the fact that the Chinese market is culinarily different. This can make the demand for individual products unobvious, which, however, does not mean it does not exist. With a large dose of certainty, one can state it does exist – in the HoReCa sector, if not in the retail one. The first step every entrepreneur should do is to obtain protection for their brand in China. An application for brand protection should preferably be lodged directly to the China Trademark Office. The most important thing is that the application should be accepted before you reveal your intents of trade in the Middle Kingdom to the public. The priority of application is tantamount to the priority of consideration thereof, yet, of course, the application alone does not guarantee successful registration. This is conditioned by an absence of previous applications for protection of the same or a very similar brand in a given product class. In many cases, traditional Chinese foodstuffs on a shop shelf differ from the Polish ones. The differences include the form, composition, raw materials and packaging. It is good to analyze the local market before starting the trade – the products from “Chinese shelves”, their package sizes and sales channels – in order to make right decisions concerning the selection of products for the “Chinese offer” and to prepare well for the fair. By “selection of products”, I mean not just the products themselves but the marketing, packaging and its size, depending on the needs and conditions of the target distribution channels. In China, foodstuffs are usually sold in trade channels analogous with the Polish ones. However, from the viewpoint of preparation, it is worth mentioning two of them. The first one is the online channel, growing at an unnaturally quick pace of 30% y/y (2017/2016). This is currently one of the most significant trade channels in China. The other one is chain convenience stores (CVS) – a channel recording growth of more than 10% y/y (2017/2016). Such stores prefer products with a very high rotation and a good value-for-money ratio. However, the most conspicuous difference between the Polish and Chinese shelf is the size of unit packages. In China, they include versions from mini and small, through medium, to gift packs containing several basic packages. The smallest ones are preferred by CVSs and internet stores distributing them as product samples. Medium and large packages are addressed to both online and traditional stores, while the largest ones, gift packs, are very often displayed by traditional stores. Reduction of unit package sizes serves two more functions: reduction of the transaction price and formatting the product for “one-off” consumption. The former is of considerable significance in the case of imported and more expensive goods, whereas the latter results from weather conditions. Many unconsumed products lose their properties some time after opening – e.g. crispy cookies lose their crispiness, becoming limp due to moisture absorption. The market requires collective boxes made of very durable cardboard. This is the logistic reality. Moreover, products are often kept in collective carton boxes on the sales floor due to excessive rental costs or maintenance of storage area at a shop. Before arriving at the fair, it is worth developing the assumptions, visualizations and samples of smaller product formats as well as their collective packages. Your stand will surely be visited by traders looking for different product formats. China, like every country in the world, has its own food-related product standards. In Poland, we are bound by our domestic regulations, and these, due to our EU membership, comply with the standards in other member states. We have got used to the convenience this brings. Exports to the UK or Romania do not require many formalities connected with the product. Export departments experienced in sales to community markets forget quite often that different regulations may be binding outside the EU. This is exactly the case in China. For entrepreneurs, this means one should make special efforts to check if our product would be admitted for import in China, and modify it accordingly if necessary. The Chinese food safety law has been strongly evolving in the recent years, including definition of new product categories, new lists of authorized food additives, as well as threshold values of individual substances in a product. Formally, the law does not oblige a producer to perform certification of products in China, yet those not complying with the standards cannot be imported. In other words, strategically-thinking producers should examine their products for conformity with the local norms appropriate for each of them. I definitely recommend such action, even for the simplest products. Arrival to a fair without certification of individual formulas may spell failure for the project and shrink potential business opportunities. During each food import to China, as a part of customs clearance, product samples are subject to testing, including laboratory tests, for conformity with the local norms. If a non-conforming product fails to pass certification before the first import and an unaware producer sends it to China, it will not be authorized for marketing. The importer will have to send the shipment back or dispose of the product. The database of the CIQ (the Chinese border authority responsible for quality testing of imported products and issuance of trade authorizations) will record this fact as a so-called “black record”. This phrase probably captures the essence of the matter most accurately. For a producer, this means that the following shipments of his goods will be subject to particularly meticulous testing. The importer will be controlled more stringently as well, regardless of which producer it will buy the product from. This results from the local law, obliging the importer to verify the product and the producer. In such a case, being in the limelght makes future customs clearances very difficult. Quite often, Chinese customers ask at the fairs whether the product has been certified. When answering, one should keep in mind this is a question about certification in China in accordance with the local standards. It is crucial that people from export departments understand the specific nature of Chinese formalities and should not give wrong answers just for the sake of quick customer acquisition. Falsely assuring a customer that you hold a certificate may cause future problems at a port and related high financial losses. Holding of documents certifying the conformity with the parameters of individual standards is not just a good practice for a producer but a positive signal to the market that the producer is aware of the existence of local norms, has acquainted itself with the elementary issues related to imports to China, and has a serious approach to this matter. It could be said that holding product certificates is a Key Selling Point for the acquisition of an indirect customer, i.e. an importer/distributor. An element worth special attention at the fair is the product catalogue. When coming to China for a trade fair, you should have it translated into Chinese, possibly in a bilingual version with English. Preferably, it should be formatted for this market, including the company’s history, good photographs of the company’s plant, quality certificates (ISO, HACCP, IFS, etc. ), information on the company’s market position in Poland, the export markets (an ideal catalogue would include photographs of shelves from different countries with the company’s products), data on the products and unit packaging versions, photographs of collective packages for the Chinese market, full logistic data, loading information in the versions of bulk loading as well as 20-ft and 40-ft container pallets. Ensuring of Chinese-speaking trade stand personnel is a must. It is a grave mistake to assume that fairs are visited by English-speakers. Many importers have English-speaking trader team. However, due to the size of fairs, they are often supported by low-skilled freelance agents whose task is to verify the offers from the entire fair and to acquire direct contacts. During the fair, Chinese customers will be interested in the producer’s plans in China – how many customers it intends to have in China, how it would manage the sales channels, how it is going to protect the business of its customers, what sales value it expects, what shelf prices it foresees, what are its marketing plans for China. A lot depends on the right answer to these questions. The Chinese use them to check if the entrepreneur knows the Chinese rules and if it has already prepared appropriately for the game. When going to a fair, a producer has to solve one more issue, which, despite appearances, is far from insignificant – namely, trade samples. A trade stand should be rich in samples. Visiting customers will gladly taste the product to develop an opinion and share it as early as the stage of conversation. Many customers prefer to receive samples by courier after the fair, to avoid carrying them around when visiting the halls and later moving through railroad stations or airports. Here is when the producer faces another challenge: how to organize local storage of samples and possibilities to send them at the customers’ request after fairs. If one lacks such a possibility, one should make an appointment with the customer to collect the samples on the last day of the fair. 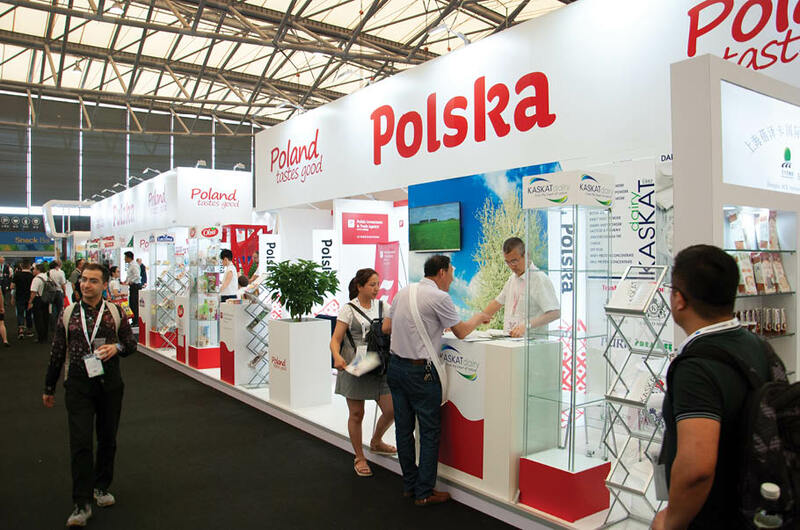 To sum up – being well-prepared for exhibition at a trade fair is an excellent opportunity to have your brand registered in China and to audit your offer for a new market. This will make your opportunities for success much higher than when coming “headlong”.